So, your backboard finally bit the dust. What now? Don't be too hasty with your next moves. Otherwise, you may find yourself with looming product returns, wasted money, wasted time, and a whole lot of unneeded frustration. In spite of what you may think, basketball system manufacturers do not build parts for one another. Meaning, you cannot have a Spalding basketball hoop and purchase a Lifetime backboard and have them be compatible. Here are some things to consider when purchasing a replacement backboard. When replacing a backboard on your Spalding system, you cannot safely purchase a 48-inch replacement backboard just because you have a 48-inch Spalding backboard on your current system. 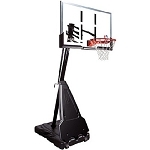 Spalding's backboard mounting brackets vary so much from system to system that backboard size alone will not be sufficient to determine compatibility. Let's say you purchased a pole system or mounting bracket separately when you first set up your basketball system. You may be able to safely determine the required replacement backboard from there. For instance, if you purchased the 316 mounting bracket, and you know for sure it was model 316, you would then be able to safely purchase the 79564 or 79307 backboard and rim combos to go with that bracket without further hassle. However, a possible caveat with this method is do not base this decision off of what a bracket looks like online and what you actually have. 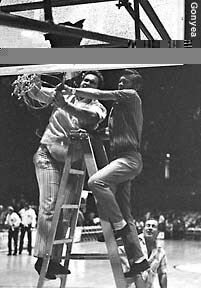 For instance, the 316 bracket looks like many other brackets on existing Spalding basketball systems, but only the 316 bracket would be compatible with the 79564 and 79307. Therefore, if you do not know the model number for sure of your bracket, do not purchase a replacement backboard just yet. 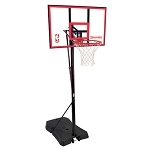 Because Spalding backboards are so tricky to work with - and Spalding does not publish much information to help you on your own - it is best to contact Spalding's customer service on the phone to confirm compatibility of a new backboard with your existing system. They can be reached at 1-800-558-5234. Give Competitive Edge Products, Inc a call if you need help with a deciding on a replacement backboard. This is not something I often hear being talked about, so it leads me to believe that when the time comes to deal with it most people are left clueless. In that case, you have come to the rescue! Great post. Is there any warranty on basketball backboard hoops? If so how long are the warranties. We have a pole b-ball hope that after 2 years, the backboard cracked. Need some advice how to replace. I also have a cracked backboard and the pieces are falling off. Is it possible to just get that replacement part? You can get replacement backboards, but if your system is 300 bucks or less, the best option is to buy a new one. You will spend at least a third of the cost of a new one on the replacement part....only to have the base break next. The 300 dollar range hoops (and less) are not made to last. If you get 5-10 years out of them you should feel like you got a deal!